Today, I am not giving you a peek at the bookshelves lining the walls of this old farmhouse. Instead, I am giving you a peek at what you’ll find spilling out of baskets and boxes. What you’ll find stacked beside my bed and by my armchair near the fireplace. I’m showing you my pile of dreams. My paper stack of wishes. I am recommending plant and seed catalogs. Why now? Why now as I put my vegetable garden to bed and watch for the first hard freeze? Because gardens are born in winter. And this is the perfect time to sign up for at least a few (free) catalogs. They’ll be the guides to your dreams come December. 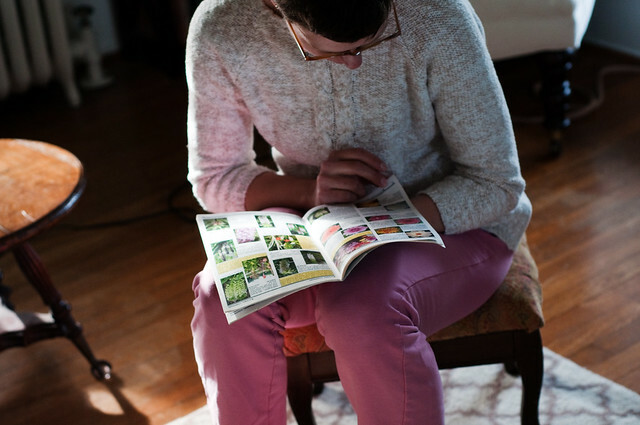 The vegetable and flower seed catalog from Seed Savers Exchange is always a glossy, full-color treasure trove. This one is perfect for winter browsing, almost as good as a collection of short stories. You’ll read about the real “Grandpa Ott” behind “Grandpa Ott’s Morning Glories,” and the fascinating history of the “Moon and Stars” watermelon. Even better, by ordering heirloom seeds from the exchange you are also supporting the biodiversity of our planet. The supermarket produce shelf offers a tiny slice – not even that, perhaps a pin drop – of the variety of creation. If a blight shows up this year favoring the (tasteless) grocery-story tomato, it will be the home-gardening seed savers and networks like Seed Savers Exchange who save tomatoes for future generations. I don’t save many of my own seeds beyond a few dried flower heads. I’ve listed that activity under things I’ll do when I no longer have children underfoot. Until then, I do my part by ordering from Seed Savers. If you ever buy bulbs through the mail, especially daffodils and tulips, your mailbox will be flooded with catalogs claiming direct links to Dutch tulip fields. They will have phrases like “fine purveyors” on their covers. Brent and Becky’s Bulbs, a family operation based in Virginia, is pretty much the opposite of that. And I love them. Brent and Becky (yes, they are real people) offer excellent service, quality bulbs, and fair prices. You can buy all the classic varieties, and you can find homegrown varieties they have named for a favorite relative or friend. Their catalog is full of advice and inspiration, and you can enjoy it at least twice a year. They send out separate catalogs for spring and fall-planted bulbs. I buy my daffodil and tulips bulbs here every year. Last year I filled a bed with their lily bulbs. And I’ll soon be planting a few of their purple alliums. The Antique Rose Emporium in Independence, Texas is a magical place. I grew up visiting it with my father, a farmer-turned-gardener, yet I somehow never dreamed of growing roses myself. Until, I came to Maplehurst. Our little corner of Pennsylvania was once well-known for the roses Quaker farmers grew here for city markets. That heritage is still evident in street names and in long memories. Last year, it seemed important to me to bring roses back to Maplehurst. Of course, now I’m hooked. I used to hear “antique roses” and imagine fussy, hard-to-please plants. If caring for antique furniture was more complicated than dusting a piece from IKEA, then surely plants were the same. Strangely, the opposite is true. If you are looking for a rose that is easy to grow, less susceptible to diseases and insects, and (bonus!) highly scented, then it is an antique rose that you want. You can also find them described as “Old Garden Roses,” and the catalog from the Antique Rose Emporium is one of the best ways to learn about these wonderful plants. Thanks to this catalog and other books published by its founder, I have gorgeous, cabbage-y pink roses still blooming in my garden today. In the middle of October. Yes, you can call me a fan. Also, I think it very important to support any business with “emporium” in its name. Just a personal pledge of mine. I grew dahlias for the first time this year, and I am hooked. My gardens all look a bit shabby by October, but the flower bed across from our front door has exploded with beautiful, bouncy, mop-headed dahlias. You can find a million pictures (approximately) of my dahlias on instagram. Like this one. And this one. I can’t seem to stop taking their pictures. I’ve done little dahlia comparison shopping, but Swan Island Dahlias was recommended to me, and I will be ordering from them again. Their catalog is beautiful and extensive, and every one of the tubers they sent grew and thrived. My favorite bit? They stamp each tuber with the name of the variety. This made it easy to remember what I was planting and where. Now I’d love to know, do any of you garden? What are your favorite sources? Please share them in the comments! Would you like to read the story behind the blog? Join my mailing list, and I'll let you know each time a new post appears plus give you a glimpse behind the scenes. No spam. Simply more of the story. Also, have you or your kids read The Stories Julian Tells? Part of that book is about gardening and seed catalogs. And catalog cats. And it involves Julian sneaking outside at night, lying on the grass, and whispering encouragement to the seeds. It’s precious. Lovely little chapter book. Karissa, I’ll be the first one to say I like the idea of gardening more than the actual thing. But that’s what winter’s for! With gardening you get your dreaming season and your doing season. And I do not know this chapter book. It sounds perfect … ordering it from my library right now. Thank you! Thanks for these great recommendations. And … for the hope of fun mail arriving in my mailbox. Glenda, that may just be my favorite bit. Good mail is hard to come by. I taught that book every year when I taught third grade. My students loved it. (Warning: you might also have to make lemon pudding at some point if you read it with your kids.) When I was pregnant with my daughter and we were trying to decide how to decorate her room, I told my husband, “I want it to look like the garden from The Stories Julian Tells.” It ended up being a garden-themed room, not exactly like the book, but still . . . the inspiration was there. I really hope I can do it next spring. I feel like I need to work with my hands and be outside more, engaged with the earth, you know? Oh Christie, I’m swooning over this. I am an avid gardener, well I was, until I moved to the South and then decided to divorce it and marry writing instead. Passion waned with all the insects and disease caused by a wet climate. So many mushrooms and mildew, I found myself spending more time trying to kill things than grow them. Anyway, you’ve inspired me once again. However, pots and window boxes full of colorful life will have to be enough, we’ll have no garden in England. *sigh* I’ll just marvel over the work of others as I stroll through the city. Love your new “shed” that looks like a tiny house. It’s a beauty. Oh, Shelly, I feel your pain. I spent two years attempting to garden in Florida’s heat and humidity. I learned there how much I require winter in every sense – not least because I need a break. 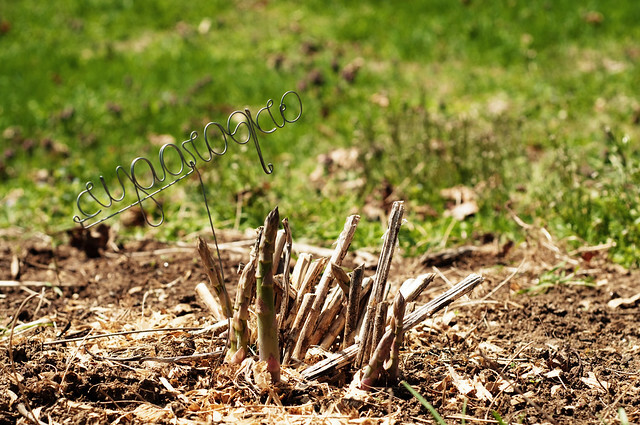 I need a hard freeze to give me (and my garden) a fresh, clean slate. lovely – I especially like your encouragement to grow dahlias anyway, even if I might not dig them up in the fall. Reminds me of the extravagence of God – he created anyway, even though we have short lives. I was admiring some butterflies in my garden this week and a friend asked how long they lived – I looked into it – they only live a few days or a month (most varieties) and yet they were worth creating. Gardens remind us of the infinite abundant love of God. And that nothing comes with guarantees, but we press on. Extravagance! Yes. That is exactly right. Champney roses! How perfect. And, yes, our visits to the roses were always followed up by a visit to Blue Bell. Good times. This post made me all swoony for seeds and dreaming about my spring garden. Thanks for sharing these resources, I can’t wait to order catalog or two 🙂 I am not the best gardener, but I enjoy it, so I guess that’s something. I use Jungs for all my seeds. They have reviews from gardeners online which I think is so cute. I love ordering local, and they’re in Wisconsin- so I figure if it can survive there it can survive here! I love gardening, inherited from my mother, I think. My favorite novel when young was The Secret Garden and i love all of L. M. Montgomery’s descriptions of gardens, especially in the Emily series. We have just finished our first full year in our new house which has extensively more property than our last. I was and am excited about gardening it, but it can be a bit overwhelming! The folks before us let things go a bit. We are slowly getting things back in order. It has good bones and structure, just needs a good bit of underplanting, and lots of shade plants, which I’m less familiar with. I’m trying to make small goals each year based on time and money available. I have plans for two beds next year. My name is Christie Purifoy. I live with my husband and four children in an old brick farmhouse in southeastern Pennsylvania. I am a Jesus-follower who believes that life, in all its pain and beauty and mystery, is a journey of love. Writing keeps my eyes wide-open to this astonishing reality. Here is where I write what I see.